In addition, after a year of "not doing" my hair and learning to love air-dried, natural hair, it was hard for me to want to go back to blow-drying and processing. So I didn't. I did make the jump and dyed my hair brunette back in March (and had it touched up in April), but since then, I hadn't touched it. It had been almost a year since Bye Bye Beehive ended and I was starting to crave a new style. My hair started seeming a little stringier (I'm sure a trim would have fixed that), and I know Daniel loves my hair when it's short, so I finally made the decision to change it up, and I knew if I was going to do it—I had to go big or go home. I took this photo the night before I cut my hair, showing the growth I had achieved over the almost two-year period (the left photo was Month 1 of Bye Bye Beehive, the middle was the end of Bye Bye Beehive, and the right photo was almost a year later after still not using heat tools). Despite how much I had grown to love my long hair, it was so much longer than I was used to, and to be honest—if your husband gives you the googly eyes and says how cute you'd be with short hair... why not give it a shot? It's just hair, right? So I chopped off 14 inches, and donated 12 to Children With Hair Loss. I picked their charity because they take hair that has been highlighted & color processed, which many organizations do not accept. And now here I am with this new shorty-short hair cut, and I'm having so much fun with it. I haven't worn it the same way yet, opting each day for waves, beach curls, a front braid, a ponytail, air-dried waves, pinned half back... seriously, the options are endless and since it's so much shorter, it just takes a minute or two to style. It's also just the right length to fit in a ponytail when I'm running so I don't have to worry about hair in my face or on my neck. And hey, if I decide I want to go long again, now I know how fast my hair grows, right? I could be back to longer locks in no time! Have you ever donated your hair? Made a drastic change? Cut your hair because your husband thought it would be cute (and no, I didn't just cut it because he wanted me to—I love short hair, too!). I would love to hear your thoughts! It is cute and has a lot of personality being short! Love this, and thank you for linking to Children With Hair Loss. Otherwise, I may never have known about them! I've often considered donating my hair when it has gotten long enough in the past, (I'm big on hair changes) but had looked into it several times, and always felt sort of "disqualified" by the fact that I am also pretty much a lifelong (not-so-natural) blonde, with hair that has been bleached fairly frequently over the years. I'm reconsidering it now! You're awesome, Aunie, and I'm a big fan of the Sauce! That is such an interesting project, I do not know if I could do it though! It is so cute short! I did the same thing in October or November last year, and I liked it til about March and now I'm in the process of regrowing it. 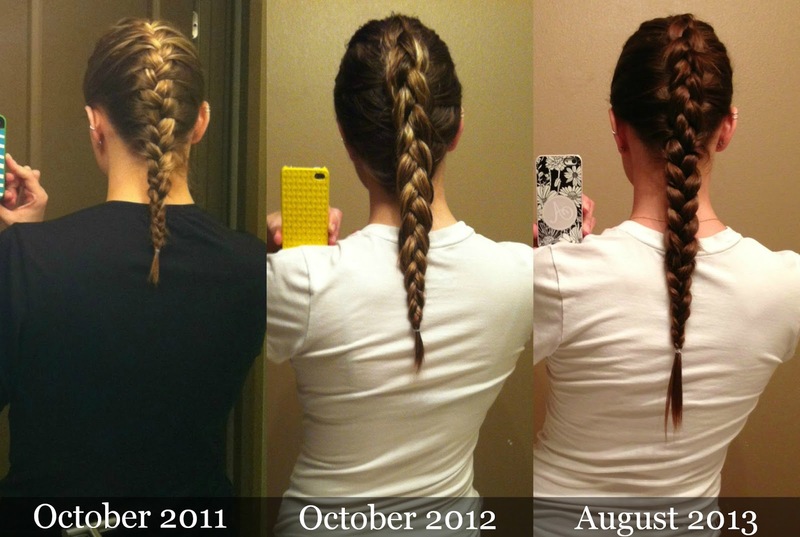 I'm ready to be able to pull it back in a ponytail again! I think I told you already but I cut about the same amount of hair off about 6 months ago. Will you please do tutorials on how you style it now? I know it seems silly but after having long hair (and needing bigger curling irons) I can't seem to get curling my short hair down. After awhile it relaxes and kind of just falls into my regular angled bob style. So I basically wear it straight in a bob or pin back my bangs every single day and I'm bored with that already. I donated 13" of my hair last March, and a couple months later, got it cut super short. I'm now in that annoying in-between phase where I don't want to go get it cut often enough to keep the short cut and am trying to grow it back out, but it's still not long enough to put back in a proper ponytail. It makes running a pain, because I end up with this sweaty sticky hair everywhere. Another month and I'll have a ponytail. I will survive! Way to go lady. I'm the same way with my hair... it's just hair so I don't mind changing it up from time to time. Love your short hair! I just recently stopped blow drying mine but its still too wild and unmanageable without flat ironing. How did you get yours looking awesome with no heat? Mines crimpy and weird and so fluffy! I love your short hair! It looks perfect on you! Your hair looks great! I may have to try project Bye Bye Beehive. I've been trying to grow my hair out and it's been "stuck" at it's current length for 5 months. I don't color it anymore, but I blow dry it and flatiron it every other day which can't be great for it. Thanks for sharing girl! Love your short hair! Thinking about cutting mine short for the first time in a long time. Where did you go? I love your short hair. It looks great on you. I also love that you did Bye Bye Beehive. I am thinking of doing something with my hair soon too. But I won't say what til I post it. haha. Love it...the idea, the project, the sassy haircut! All of it. I'm amazed at how easy it is to send in, that's awesome. I LOVE short hair! It's always such a relief to get so much cut off at once and it looks great on you too! I've donated my hair twice but now I can't last long enough in between cuts to let my hair get long enough to donate. Oh man, hair changes. When I left for out of state college I decided I wanted a whole new look: new nickname, new style, new haircut. I went from a waist-length platinum blonde to chin length dark brown with a purple sheen. My mom took one look at me, dropped her dish rag, started sobbing and locked herself in her room :( still makes me chuckle to this day. I just cut my hair that length and I LOVE it, but i'm definitely new to styling it, so i'd love to see some of the many ways you're doing your hair! Will I? I don't know.. maybe... But, I need to do SOMETHING with it! For now though, I'm digging my long locks, so I think I'll stick with them for awhile. Love the short 'do on you, though! I just LOVE you for doing this! I wish I hadn't cut my hair back in June just so I could donate but it was so unhealthy. I do have a goal to do this at least once in my lifetime though! You're so awesome for doing this, Aunie! Your hair is so cute! I cut off 6 inches two weeks ago. I would love some short styling tips from you. I am having some trouble getting waves in my fine and super straight hair.